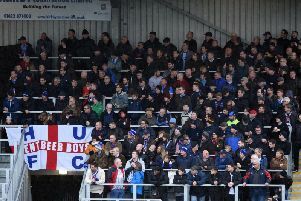 HARTLEPOOL United boss Paul Murray has slammed his side’s display as “diabolical” after questioning their passion and desire following the FA Cup defeat to Blyth Spartans. Pools were denied what looked a clear goal from Marlon Harewood which would have put his side 2-1 up but the referee deemed it hadn’t crossed the line. But Murray was not using that as an excuse and he has slammed his side’s second-half performance. Pools took the lead through Jonathan Franks in the 31st minute but former Pools academy player Stephen Turnbull equalised with a free-kick in the 56th minute. Jarrett Rivers then snatched a late 2-1 win in the 90th minute to send the non-league side into the third round. Murray said: “There was some angry words exchanged at the final whistle. “We did well first-half and created some opportunities and should have scored another couple. “We were even worse that second-half than we have been in the league. “It was total chalk and cheese. It was diabolical, I felt second-half was nowehere near good enough. Tom Wade, meanwhile, was delighted with his side’s performance. Wade said: “It is hugely special for me, I am a Blyth lad. “We have a great team here at the club and we all work together very closely. “It means so much to me and I know a lot of the supporters. “This win is hugely special and I am hugely proud, privileged and honoured to be the Blyth manager. “To get into the third round is a fantasy for us, I cannot thank them enough for the effort and commitment put in. “A lot of the younger lads stood up and were counted.